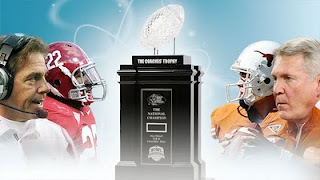 The college football season officially ends tonight with the BCS Championship between the University of Alabama and the University of Texas squaring off at the Rose Bowl in Pasadena, CA. Alabama is a 4 point favorite to take home its 13th national championship tonight. As an Alabama fan, it doesn't get much better than this. Well, a victory would certainly be nice. But, just three short years ago the Alabama program was completely in the dumps. Exit former Coach Mike Shula, enter current Coach Nick Saban. Coach Saban has taken the Alabama program from the depths of despair of 2006 to the crown jewel of the college football world in 2009. He is a ferocious competitor and demands excellence from his starting unit all the way down to the water boys on the sideline. Not much is said about how much money he makes now. In fact, there are those who feel he is being under paid at about $4 million a year. That is debatable, of course. But, Alabama had a net profit of nearly $40 million in the last fiscal year. I would say he has earned his keep. This game will come down to the basics of football; blocking and tackling. Who has the best fundamentals in a game of this magnitude is the one who most likely will win. Alabama rarely makes mistakes. But, they have never been in a game this big. Not even the SEC Championship can compete with this game. If they make mistakes, Texas will take advantage. Both teams will be tight at the outset of this game. Whichever team has had fundamentals stressed into them the most will come out on top. I am hoping that the team that is fundamentally sound the most will win. I like the chances of Alabama being that team.